While there is very few information available about it, Black Spotted is the brand new OPI effect. If you are over crackle, spotted polish might very well be for you! I really love the "spotted" effect, I think it looks much more random, mysterious and grown up than plain crackle. 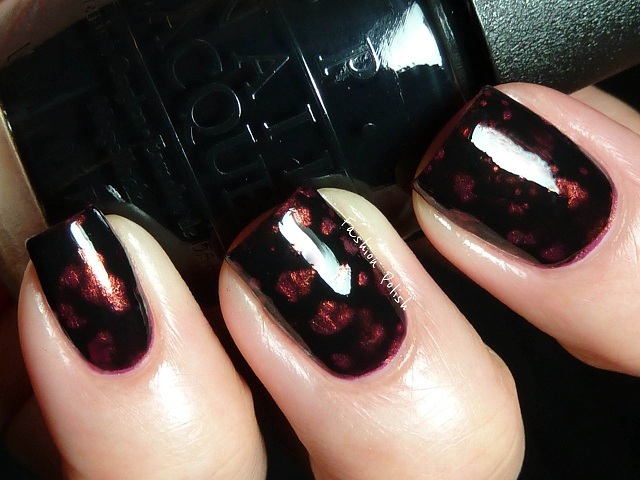 I could totally imagine it as a Halloween manicure for example or over a gradient, duochrome or glitter. It was also very easy to work with, relatively fast drying but allowing quick touch ups too. The polish underneath has to be completely dry, use fast drying topcoat if necessary otherwise you'll see some "cracks" on your nails too. Thin coats will create very small and numerous spots, thick coats will almost entirely cover you nail with the exception of a couple of big spots only. Once applied on the nails, it's very thin, unlike some crackles that tend to add some thickness to your manicure. If you use a fast drying topcoat, it will most probably peel. It dries to a shiny finish anyway so I skipped it altogether. 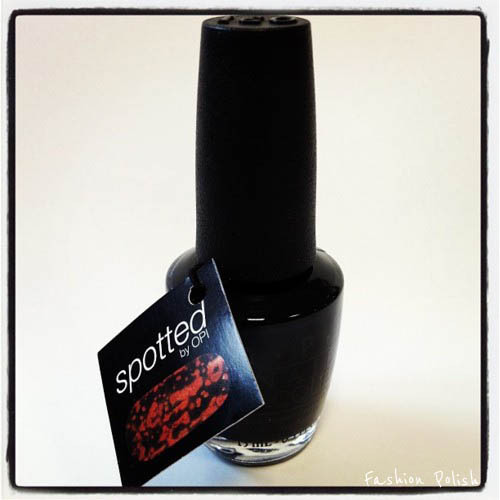 Black Spotted is currently available in French Sephoras as part of the Amazing Spiderman collection, retail price 13,90€. I've heard it's been "spotted" (LOL) at Ulta in the US too but I really couldn't confirm the information for it had been described as a France exclusive so far. I love it! I don´t like crakles but this it´s great! I am pretty sure I really like it :) Hope it does come to the States! I REALLY hope OPI brings it over to the US soon. Major props to OPI for such an awesome idea (and execution). This is the first time I'm hearing about Spotted, but it looks pretty cool. Hopefully it'll get a release in the US. This is amazing... I can't wait to get my hands on this... just when I wanted more information on this you came up on my feed. Thank you! Wow, I LOVE this! I'm glad because I really hated the crackles! YAY! really want this to come to the us! OMG YAY. I need to find a way to get ahold of this polish!! The swatches I saw floating around he Internet I didn't love but after seeing this post I really hope they bring this to the us!!!! Yyeeeeyy obviously! I love it! Want one, for sure! Thanks for the fast review! This is very interesting! I'd be interested to see if they launch a line of these in colors. I think this I will like they should bring this to the US. I haven't wanted a polish this bad in a long time! I hope I can find a bottle at Ulta... Or it comes to the US! wow this is way cooler than crackle/shatter - i wanna use it over just spotted the lizard! Wow! I didn't see that coming at all. 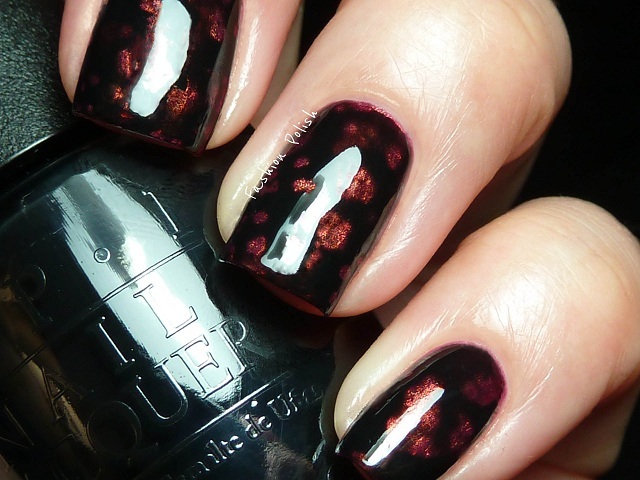 No wonder OPI hasn't jumped on the magnetic polish bandwagon! Woman u have made my night!!! Its like animal print on a bottle!! Holy shizzle!!! I want this badly!!! Good job OPI!!!! Wow u have made my night! This is like animal print on a bottle!!! Perfect job OPI!!! Hmm interesting. Perhaps you could swatch it over a lighter/more vibrant base color? This is the first I have heard of "Spotted". Seems cool and I definitely can not wait to give it a try. I wonder when it will come to the US? I think its super cool! I want to get my hands on this! I LOVE this and WHY in the world is this not readily available in the US Spider-man collection??? I love this! It definitely looks very mysterious and I like it much better than the crackle effect. Can't wait to get my hands on it! OMG ! encore un truc space ! l'effet est sympa n'empêche ! This is insanely amazing! I hope I can find it soon in the US! Thanks for sharing. I find it WAY more interesting than a crackle finish and I hope it arrives here in the USA soon! wow! This looks amazing! Love it! That looks so cool! Love the effect. WHOA!! this is ah-mah-zing!! i am so excited to see this, very very cool and UNIQUE which is *cough* hard to find these days :) Thanks for sharing! I love this effect! I'm not a fan of crackle but this one is super amazing! Cool! I like this more than the crackle..
a definite YAY! i so hope this goes further than France, what a winner!! Love it! I hate crackle but this looks awesome! Oh this really looks gorgeous! It's like you did a sandwich. Wow! I hope this shows up somewhere I can get it soon! Applause! This is something I will get when it's out in retail. I never liked any shatters/crackles - too rough a texture for my taste. I have Cult Iconic and cannot wait to dupe what you have shown here. Awesome! 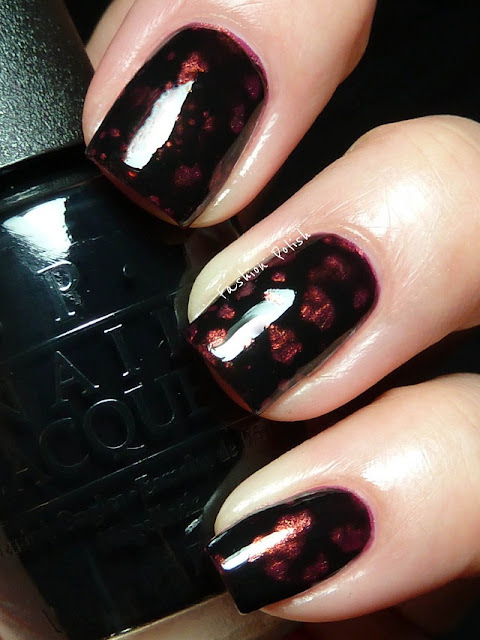 I'm not very good at nail art so I'd love to try something a bit easier, like this! Um, YAY!! I've only heard about this today, and you're the second post in my (massive) feed which mentions it. New lemming!! Ohhhh my god that looks amazing! I want it! I love, love, love it- can't wait to get my hands on this! I emailed OPI about this polish. They said it was not going to be sold in the US because there is a Patent on the polish. Different and classy at the same time! Like I said on Instagram, I am so super jealous you have this one! I wish I could find it myself :(. I'm in Poland and our Sephoras sell this too :) I'm having it on my nails over Ozotic 621 right now and totally love the effect! I also agree with you that it looks like something they could put in their Halloween collection, makes me think of a spider's web when put on in an extremely thin coat :) And yeah, it's so much better than the regular crackles, looks like some sort of a gothic lace. I just wonder why there is no official note from OPI about this, weird. gosh this looks so cool! i wish it were availble in the US too! Very cool! I kinda want it, but I'm not sure I'd use it enough. I find these way better than shatter! Wow this needs to get to the U.S. and stat....don't even check ebay unless you want to pay 50 to 70 dollars for nail polish. Love it, want it! Crackles are so passé. I just love how different this looks! I hope they make this available in the US soon! I cannot wait to get one! I could have so much fun with this! Hello....I just found this on Amazon....17.50 to 45.00 a bottle.Waiting not so paitently for it to flood the market.